Welcome! - Looking for Your Marbles? 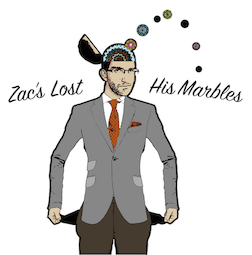 Zac's Lost His Marbles is proud to offer some of the finest handmade contemporary glass art from all-over the world available today, from our collection to yours. We have spent years cultivating some of the finest handmade marbles and other glass art objects that are the perfect complement to any interior space. If you are new to marbles, you will quickly learn that not only do glass marbles add a flash of color, visual texture, and interest to a room, they will last for decades with only the most minimal care. Give a gift that is truly distinctive, unique, and remarkable. Imagine what a collection of handmade glass marbles or sculpture would do for your home, office, business, reception area, dorm room, or restaurant. Any space can be made better with the sparkle of glass. Borosilicate glass is one of the most unique glass formulas in modern-day due to its ability to endure high temperatures and rapid heat fluctuations without breaking. Its legendary durability has made it a highly sought after artistic medium. Artists working in this distinctive medium are able to create glass marbles with exceptional detail, clarity, and lasting quality. Glass marbles made of borosilicate also make lovely gifts. Include a Wooden Marble Stand to allow instant display possibilities.